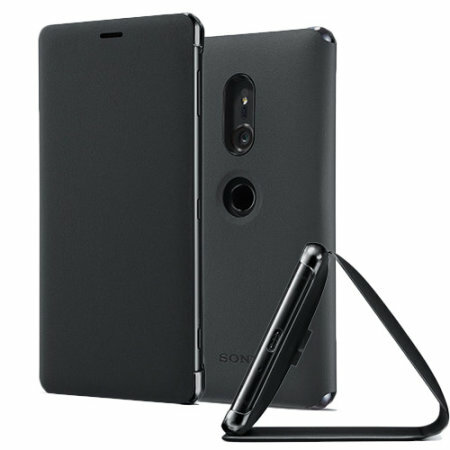 This high quality official SCSH40 bi-fold folio case from Sony houses your Xperia XZ2 smartphone, providing protection and access to your ports and features while incorporating a built-in viewing stand - in black. My favorite feature is that the phone turns on when you open the case and shuts off when you close it. Loved the color and met my expectations. Exactly what this phone needs. This phone is slippery. It needs a case for that reason. All the features I wanted in THIS case are excellent. Sleep mode cover, sleek design for my outer purse pocket. Haven't used the horizontal stand design feature yet. Got it today: Dec 16 and ordered Oct 17 so a bit of a delay but I had forgotten its features so was delighted and thankfully hadn't cracked my phone as this phone is prone to falls. The quality and material are much better than the official flip case on XZ premium. The case doesn't feel that thick and is comfortable to hold. I like the idea that the kick stand can be used when detaching the plastic piece at the back of the phone, making it more secured when the stand is not in use. Fits perfectly. Material seems strong and durable. All in all I'm extremely happy with the case. Before you buy this product you should know that it leaves the sides exposed to dings somewhat but has protection for the edges and both front and back. Having said that, I believe it is the most aesthetically pleasing XZ2 case available. Just like every other Sony case, it turns off the screen/locks the phone when you close it which saves battery. It has a black ring around the camera so that light doesn't reflect into the lens from the camera flash. SCSH40 Style Cover Stand will also work as a stand as is implied in the name. I definitely recommend the SCSH40. Especially if you're someone who doesn't like ugly phone cases this one takes very little away from the design language of the phone.